If you’ve been following me for a while, you already know that I have an obsession with all things floral , bluebirds and vintage fawns! Can yo blame me? The sweetness that they bring to my heart will never die and I love sharing them with you! With this newest design, I actually think I have a new favorite :) Besides it being multi-color, it actually has a second part to it.. A gorgeous rose cut out that can be place on the edge of the circle to give it that extra touch of loveliness. I hope you all enjoy this one as much as I do :) To download click here. Thanks sooo very much for all your wonderful shares here always Keren. I was actually surfing through all your sites here last night, and was pretty surprised, cause we´ve just found out, that we were having our first grandson here, after we´ve had 7 granddaughters for the last 18 years, and I´ve found soo many fun things here on your site for the girls the last couple of years, so now that I have to think babyboy, I ofcause also went here to look. I was sure, I would find loads, after all the beautiful girly stuff I´ve seen here over the years, but was I surprised, when I found out, that there was actually only one thing for new babyboys and 2 more a a little bigger boys, but else all the rest hundreds of awesome images were all for girls only??? Never thought of this before, as I always looked for girly stuff, but now I certainly see it, that the boys has been a bit forgotten, so guess you don´t have any boys either? ha ha ha But wouldn´t you considder it in the future maybe?? You just do such gorgeous work and I love all the girly stuff, you´ve shared with us in the past, and so does the girls. Have a wonderful week-end everyone. thanks so much!!! I love these!!!! I know where to get a cute invitation that would go great with that cute little fawn!! 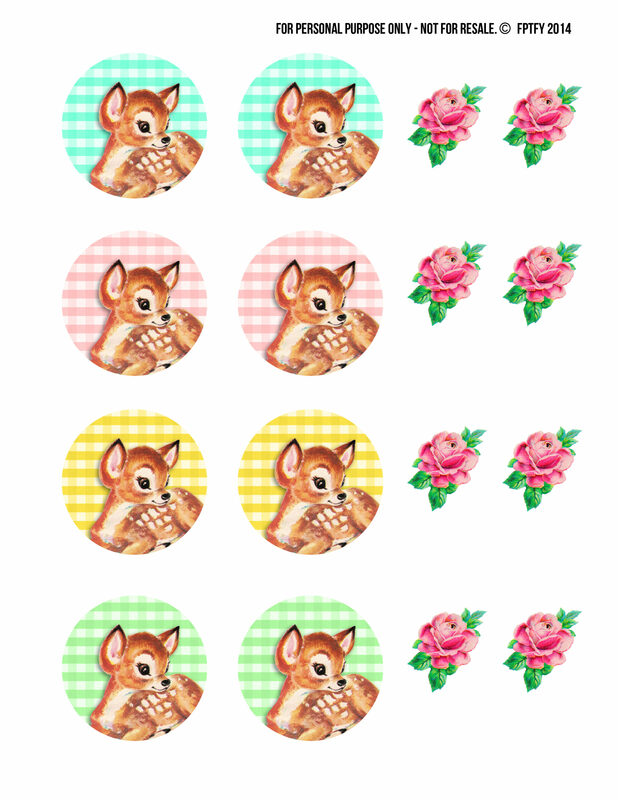 Keren, I agree 100% – there’s just so much sweetness in these, gingham, the little fawn and that little rose (which would also be cute on wee frames or tags, etc). My daughter and her family live in the country and I so enjoyed taking my grandson for walks out there. One day we saw a mama and a “Bambi” at the side of the road. Mama ran away and the baby was left. I reached down to pet the baby and she was absolutely motionless. You’d have thought she was a little statue. I guess as young as she (or he) was, that God-given instinct to “freeze” was already functioning well!! I was told by my daughter that she’d heard if you touched a baby, mama wouldn’t have anything to do with it afterward. If I’d even thought that, I’d never have touched her. I’m hoping that isn’t true! But the baby was beautiful! Everytime I see a photo of a fawn, I think of her. These little tags are precious!! Thank you so much – AGAIN – for sharing all your wonderful creations. Hugs, hugs, hugs!